The U.S. Navy focus on Littoral Combat Ships won’t necessarily keep China happy, but they’re still a good idea. Call it the Woody Allen principle of maritime strategy: ninety percent of life is just showing up. And indeed, LCS proponents raise some compelling points about the vessel. The U.S. sea services’ Cooperative Strategy for 21st Century Seapower unfolds along dual tracks, directing the U.S. Navy, Marine Corps, and Coast Guard to remain the preeminent combat force in the Western Pacific and Indian Ocean for the foreseeable future while also building partnerships and coalitions to safeguard maritime security throughout the world’s oceans and seas. The former enterprise relies on the familiar panoply of warships, including aircraft carriers, guided-missile cruisers and destroyers, and attack submarines. But top-end combatants are overqualified for policing the sea for pirates, weapons traffickers, and other forms of lawlessness. They verge on wasting assets when deployed to, say, the Gulf of Aden for counterpiracy duty. Less capable vessels like the Littoral Combat Ship can discharge such missions adequately at lower cost, letting heavy forces concentrate on their chief duty: preparedness for battle. Unlike traditional U.S. Navy multi-mission platforms – ships that perform a variety of functions, from anti-air warfare to striking at targets ashore – the LCS is a single-mission vessel. Or rather, it performs one mission at a time. The ship is designed to carry “mission modules” that give it a modest capability for mine countermeasures, anti-surface warfare, and anti-submarine warfare. Assuming the technology pans out, an LCS will be able to put into port and change out one module for another within hours, reconfiguring itself to execute a different mission. This isn’t a ship built for the battle line. LCS backers also observe that size matters. Foreign partners find smaller, single-mission ships less imposing. That’s part of the reason why U.S. Coast Guardsmen have proved such adept coalition-builders: their vessels resemble those found in foreign sea services. Coast Guard ships are smaller than their navy brethren packed with sensors and weaponry. And they were designed specifically for constabulary functions. An LCS squadron will presumably let the navy tap these same qualities. Forging coalitions in the South China Sea will prove challenging, as a report released last week by the Washington-based Center for a New American Security shows. (Your humble scribe contributed the chapter on maritime security.) In large part that’s because China opposes any consortium among Southeast Asian states. Beijing insists on dealing with these states individually rather than as a unit. And it reflexively portrays the U.S. naval presence as an implement of latter-day containment. In the boilerplate routine among Chinese officials and pundits, an enduring “Cold War mentality” manifests itself in America’s forward strategy. But Beijing will find it far harder to depict an LCS squadron – a flotilla unfit for major combat – as Washington’s way of quashing China’s rightful ambitions on the high seas. The LCS, then, may be the right ship for the Southeast Asian theater while drawing the venom from Chinese rhetoric. In some ways, an LCS squadron would constitute a throwback to the U.S. Asiatic Fleet, which anchored the US presence in Asia until crushed by Japan early in World War II. The Asiatic Fleet was a light force, not a battle fleet. Its chief purpose was diplomacy. It showed the flag while upholding the “Open Door” policy in China. A heavy cruiser was assigned as flagship. Its entourage included elderly craft like light cruisers, destroyers, riverine gunboats (think USS San Pablo from the Steve McQueen film The Sand Pebbles), submarines, and support ships. Shortly before the outbreak of war, fleet commander Adm. Thomas Hart quipped that his vessels were all “old enough to vote.” The fleet was “of minor combat value, and had been so for a long time.” Hart moved his ships from Shanghai to Manila as storm clouds gathered over the Western Pacific. This didn’t spare the Asiatic Fleet from destruction. To survive as a fighting force, the Asiatic Fleet needed reinforcements from the larger U.S. Pacific Fleet. Help never arrived once Japanese carriers struck at the Pacific Fleet at Pearl Harbor. But U.S. forces are staged far closer to the theater today, providing a backstop. Once the LCS contingent – the nouveau Asiatic Fleet – is in place, forces optimized for maritime police duty will operate from bases around the South China Sea rim. Heavy forces are in Guam and Japan, far closer than Hawaii or the U.S. west coast. Yet U.S. forces could be arrayed even more effectively. Washington should work with Canberra to expand last November’s basing agreement. Positioning a U.S. Marine expeditionary unit at Darwin, along Australia’s northern coast, is good. Positioning a U.S. Navy carrier or surface action group in Australia would be even better. That would let U.S. maritime security forces do their work in the South China Sea with the cavalry just over the horizon, outside the southern arc formed by the Indonesian archipelago. The Littoral Combat Ship, then, may be a good standard-bearer for the United States in Southeast Asia, precisely because it poses little plausible threat. 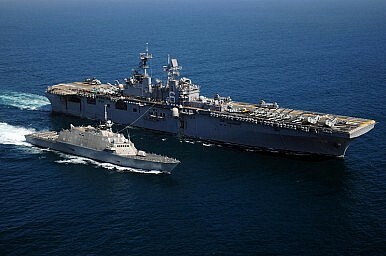 An LCS contingent could let the U.S. sea services construct partnerships in this important waterway while putting China on notice that the United States is in the region to stay. And they can do so while holding combat forces in reserve, largely out of harm’s way. Will such a posture mollify Beijing? Doubtful. What would, short of the U.S. Navy’s evacuating Asian waters? But unassuming ships like the LCS hardly look like instruments of Cold War containment. Chinese protests about increased U.S. naval activity in southern waters will ring hollow with important audiences. In short, the messaging seems right. James Holmes is an associate professor of strategy at the US Naval War College, the co-author of Red Star over the Pacific, and the co-editor of the forthcoming Strategy in the Second Nuclear Age: Power, Ambition, and the Ultimate Weapon.The views voiced here are his alone.